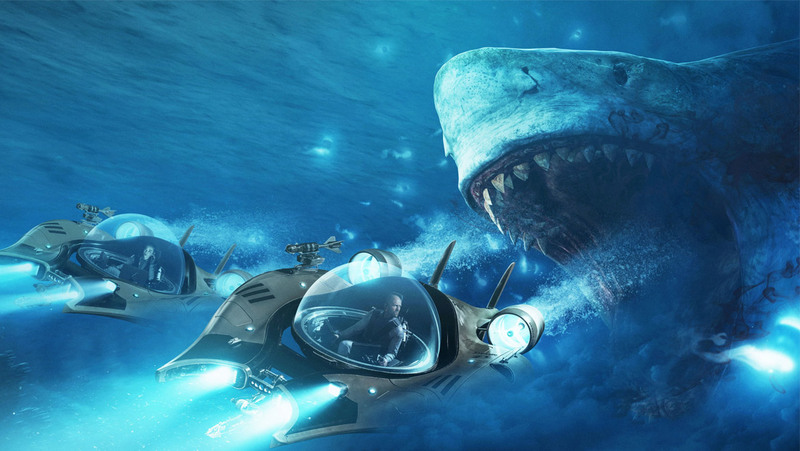 Moments before our screening of The Meg, a friend said the only thing he wants out of the prehistoric shark thriller is for star Jason Statham to punch the shark in the nose. It's a totally ludicrous thing to ask for as a prerequisite for satisfaction but in a way it made sense. Statham, with a bald head, perma-scowl, and bruising demeanor has survived so many ridiculous action movies, including the Fast & Furious franchise he's now a part of, that punching a shark may rank low on the list of dumb things he's done on screen. But there's more, in that it's a hope for the film to have the same zero-fucks-to-give mentality as Sharknado, just with bigger stars and a better budget. Well, Statham does indeed go one-on-one with the giant predator on multiple occasions, but The Meg is anything but a Sharknado movie. It's a Statham movie, one in which the most ferocious predator in the movie is him and not the computer-generated beastie. And like any Statham vehicle, there's a recognition of how absurd the whole thing is, but director Jon Turteltaub (of National Treasure fame or infamy, you decide) never strays too far into B-movie territory. The Meg is surprisingly grounded, occasionally campy, and has enough toothy thrills to make you fearful of the ocean's depths. Statham plays deep sea rescue diver Jonas Taylor, a drunken recluse in self-imposed exile after a dive years earlier ended with him unable to save everyone. The event has haunted him, especially since he's been branded a lunatic for suggesting the submarine had been attacked by some giant external force. Five years later he's vindicated when Dr. Zhang (Winston Chao) and old colleague Mac (the always-reliable Cliff Curtis) bring him out of retirement to rescue a crew trapped at the bottom of the ocean in a submersible, which has been attacked by some gigantic creature. He refuses, until he learns one of those trapped is his ex-wife. "It's a Megalodon", Jonas says matter-of-factly upon discovering what it was that has been causing so much trouble. A Megaldon isn't just another shark. It's the living embodiment of "We're going to need a bigger boat", but like if somebody said it millions of years earlier. The prehistoric monster measures over 20 meters long, has jaws the size of a small child, and should be extinct. But nah, it's just been chillin' deep underwater waiting for just the right thermal gap so it can shoot up to the surface. There's some science-y nonsense the film conjures up to explain all of this and it can be super clunk when you just want to see the Meg start chowing down on folks. The shark's potential snacks are a lively bunch, though, and give the film some much needed punch. Alongside Statham, Chao, and Curtis is future Batwoman and all-around badass Ruby Rose, although she sadly doesn't get much action for someone promoted heavily in the film's Chinese marketing strategy. This is a Chinese co-production and you can see it in the Shanghai setting, the brief spurts of subtitled dialogue, and in the casting, which includes Li Bingbing as Zhang's daughter, Dr. Suyin Zhang. Rainn Wilson, Page Kennedy, Masi Oka, and Olafur Olaffson round out the adult cast, while Sophia Shuya Cai is Suyin's adorable daughter who just wants to see Jonas and her mother hook up. While the romantic chemistry between Statham and Bingbing is laughable (he has more chemistry with Curtis, honestly), they're pretty believable as a shark-fighting duo. Jonas and Suyin bicker/flirt constantly as they endure some harrowing scenarios, made all the more intense by the natural dangers of the great wide ocean. Jonas is constantly within inches of becoming gristle between the Meg's teeth; even when he's in a Star Wars-esque underwater vehicle there's the danger of being smashed to pieces. When Suyin challenges the Meg in a supposedly-indestructible shark cage we know it's doomed for failure. Plenty of people get eaten along the way, some in deservedly hilarious fashion, and others in ways that are just tragic. While funny, there are genuine moments of terror that keep you mindful of the film's stakes. When a crowded Shanya Beach suddenly becomes the Meg's personal feeding ground, with even tiny dogs trying to outswim it to safety, the scene is chaotic but also pretty funny. References to Jaws abound, of course, but there's no aim to be anything resembling Steven Spielberg's classic. Turteltaub isn't trying to keep the Meg as some unseen destructive force. On the contrary, the Meg is everywhere and anywhere all at the same time. We always know when it's coming, and that does dull some of its impact as a looming threat. The simple plotting doesn't exactly leave much room for the supporting cast to have much color, but that's okay because they mostly exist to be shark food, anyway. All except Statham, of course. He does what he was brought there to do, which is make us believe one man can take on a giant prehistoric shark, live to tell the tale, and hopefully take on an even bigger shark the next time. If his pal Dwayne Johnson can take on flying wolves and armored turtles in Rampage, why can't Statham beat up a Megalodon? Maybe a Rampage/Meg crossover is in order?